It’s a shame that Captain Fantastic was released in only a limited number of theaters. The movie is simply one of the best indie films released this year. 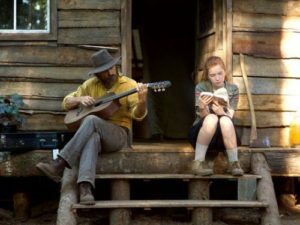 Headlined by a strong but subtle performance from Viggo Mortensen (A Dangerous Method), Captain Fantastic tells the story of Ben (Mortensen), a father who’s raising his six children in the woods, on the land, away from society. When he finds out his mentally ill wife just died after being in the hospital, the family take a road trip to stop the burial and fulfill the children’s mother’s true wishes of cremation. The movie is part road trip, part family drama, part comedy, but through it all is an exploration of the tug and pull that many parents face when raising their children, between protecting them from the harsher realities of the world and feeding them into the consumer-obsessed, politically correct society norms. Ben’s family’s out-of-society life hits viewers squarely across the head in the opening scene, when the eldest son Bo (George MacKay, How I Live Now) kills a deer with his hands and a knife then eats the raw liver as his father tells him he’s now a man. This might sound offputting, and it was to me, frankly, but let’s face it: When you’re living on the land, you catch what you eat. Captain Fantastic quickly shows us, though, that this is act is (mostly) just a coming-of-age ritual for the family. They live in a house, grow crops, exercise in daily “training” sessions, and are home-schooled to think as well as learn. Once they’re on the road in their bus called “Steve”, their lifestyle is shown in clear contrast to the society norm. The family bucks against the tide from the different styles of children upbringing at Ben’s sister’s (Kathryn Hahn, Happyish) house to the protective ideas of Ben’s father-in-law (Frank Langella, Robot & Frank). This movie, written and directed by Matt Ross (28 Hotel Rooms), isn’t about which type of lifestyle is better (pros and cons are shown for both). It’s about the relationships and growth of the characters, who are played fantastically by the whole cast. Ross himself directs the story lovingly, with sweeping vistas of countryside amid touching personal moments. The only extra is a promotional featurette, but it does give some interesting insight into Ross’ inspiration for the film as well as Mortensen’s preparation for the role. Still, this Blu-ray is worth its price for this gorgeous and heart-warming story alone.